In the practice of management the human element has evolved, developed, and expanded just as swiftly as industry and technology. The behavioral sciences are an integral part of the field of management, and the professional literature in this discipline has proliferated. 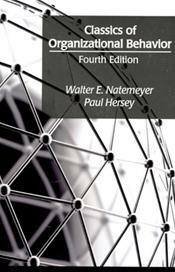 Within this immense body of knowledge, Natemeyer and Hersey acquaint the reader with 54 of the most outstanding writings on the subject of organizational behavior in the last 100 years. Classics of Organizational Behavior provides a wide exposure of analysis, including the genesis of organizational behavior, the links between motivation and performance, a discussion of interpersonal and group behaviors, the nuances of leadership and power and influence, how to increase leadership skills and organizational effectiveness, and the interplay between organizations, work processes, and people. The fourth edition is greatly expanded by 18 additional selections that have profoundly changed management thinking and practice into the twenty-first century.